Omgiv deg i det store skuespillet i Versailles-palasset og hagen på en liten tur fra Paris. Nyt henting fra Paris-hotellet, bris forbi køen på Versailles og ta en liten tur gjennom slottets utsmykkede interiør. Oppdag den rike smaken av Louis XIV, som bygde det enorme 700-romskomplekset, som tilbringer rom med ekstravaganse og luksus. Ta deretter en rolig spasertur i palasshager før du kommer tilbake til Paris. Få det beste fra begge verdener med en blanding av fritid og et guidet besøk. Was picked up on time from our hotel, was informed that they would be a little later than first booked but was on time. 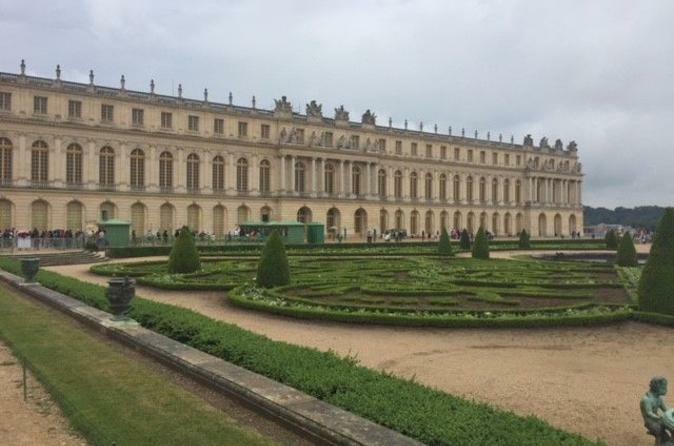 The trip to Versailles was informative with the driver showing us some of the Parisian sights on the way. Arrived at Versailles and was met by our tour operator who promptly took us into Versailles and once we were given our tickets she took us in and gave us head sets so that we could hear what she was telling us. She was very knowledgeable and interesting as she took us around the palace. We went for just the afternoon session but really needed a whole day day to be able to see the whole of the gardens which are massive. Once we had been taken around the palace by our tourer we were free to stay and look around the palace further, then Lyn the gardens. You can get a train from the gardens to take you further down the garden, the ques are long, you can also get a golf buggie to drive yourself again ques to get one and they are an extra cost for both of these. Versailles is very busy and lots and lots of people going around, so miss if you hate crowds, although the gardens give you relief from the crowds. Don’t let the crowds put you off going though as it was amazing afternoon and worth the trip. It is quite a way from the centre of Paris with a long drive. Do be very careful with your money and belongings in these Parisian attractions and around the out side of them as well. Thanks to our driver Rudolpho who navigated his way with ease and humor. Our guide Clotilde was AMAZING. What a historian!!! Thoroughly enjoyed this trip and would definitely recommend. This tour was excellent. We went on 1/2 day tour. My wife and I went in early December. The hotel pickup was right on time and the driver was very nice and knowledgeable. The tour is only 1.5 hours but we saw all the highlights. We only spent a short time in the gardens since it was windy and cold. The 1/2 day tour is plenty long in winter months, would probably do full day tour when the weather is warm. Everything went according to schedule - pickup at the hotel, transfer to tour guide, the tour and pickup.Thanks for a great day. The hotel pick up and drop off was very nice. The drivers were on time, friendly and helpful. Our guide at the palace very knowledgeable and friendly. The headset made it easy to hear her even with the crowds. I would recommend this tour. It was well worth the money. The driver picked us up at our hotel at the designated time and we met our tour guide at Versailles. Audree/Audrey? was our guide and she did a beautiful job describing the history of the castle, grounds and the items inside the castle. In addition, she helped us navigate the crowds and gave us tips on what to see in the beautiful gardens, which we explored on our own. The driver picking us up was on time and got us back into Paris safely. It was a great afternoon and worth leaving the city to explore a bit of history and grandeur at Versailles. Skip the line is the only advantage and see the important places within short period. But if you need to look each and every corner must spend the whole day. The hotel pickup was great and priority access is a must. There were 3 hour waiting lines for those without the tour access. Our tour guide was great and the use of microphones for communication was amazing given the number of people and the noise inside. 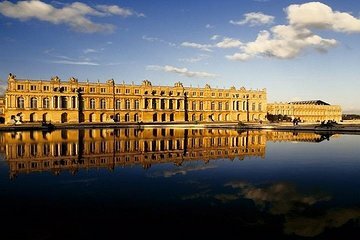 Highly recommend this tour as a good way to see Versailles.